We recently completed an elegant aluminum patio cover project for one of our customers. This design features insulated panels that help to keep your patio cool and dampen the sound of rain. Insulated aluminum is a better choice than thin sheet metal because during the summer the sun heats sheet metal making your patio cover feel like a broiler oven. To learn more about the benefits of an aluminum patio cover read our recent article. Many of our clients come to us because they recently bought a new house that either doesn’t have a patio cover or the cover is so small that it’s unfunctional. 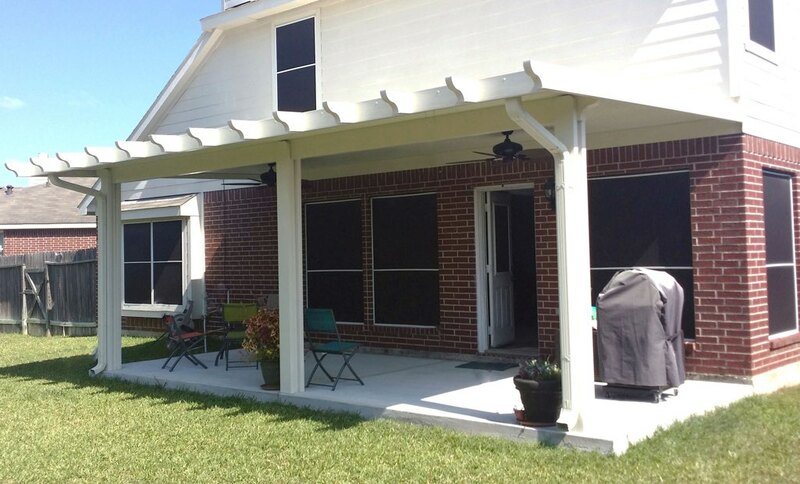 That is why Affordable Shade Patio Covers exist to help homeowners just like you build patio covers so that they can enjoy their yards year around. We offer free design consultations. During your design consultation, we will discuss what you want built and your budget. We try to work within your budget so that you get the patio cover you want for your home. We also have 100% financing so that can get the patio cover you want now. Give us a call to schedule an appointment.